I got my first credit card at 23. I was right out of college, and extremely fresh at a new job. I had zero credit history at that time so I applied for a credit card through the Madison credit union I’d been with since I was kid. The card didn’t have any perks, and the spending limit was low, but there weren’t any annual fees. Those first couple of years, I only used my credit card for groceries, and bus and plane tickets. I made sure to keep my balance low enough so I could actually afford the payments, and I made sure to pay those on time. Eventually, I qualified for some higher-limit credit cards with perks and rewards. It doesn’t always go that smoothly with a first credit card, but I had some help along the way. That being said, there are certainly some things to consider before you get your first credit card, and some tips to help you after you’ve qualified for one. When can you get your first credit card? You can get your first credit card at 21 by providing a creditor your social security number which they will use to check your credit report. If you are in college, and don’t really have a steady source of income, you should be able to get a student credit card the same way. You can technically get one before then, but you’ll need to have proof of your income or get a co-signer to apply with you. A parent is a great co-signer option, but remember: Their income and credit history are used to determine whether you get the card or not; and, their credit history could suffer if you don’t use your card responsibly. There are many different types of programs so choose a credit card that fits your lifestyle. Why should you get your first credit card? I’ll tell you one thing: The answer shouldn’t be that you want to purchase that THING you can’t quite afford with your current wad of cash. In fact, there’s a ton of responsibility that comes with owning a credit card. Before you have your first one, your credit history is going to be virtually non-existent; this first one is going to set the tone for your credit history moving forward. This means you’re going to need to make sure you can pay off your balance each month–which means you’re going to need to have at least a rough estimate of a personal budget. If you don’t know how much income you have coming in and how many expenses you’ve got going out each month, how will you know if you can afford your credit card payment? You’ll also need to make those payments on time each month to avoid paying late fees, which hurt your credit score. In fact, a good chunk of your credit score is based on paying off your debts on time–which makes sense: Future lenders can get a sense of whether or not you’ll pay off future debts on time by looking at your past payment history. So, in short: Your desire to build a good credit history is what should drive you to apply for that first credit card. What should you do with your first Madison credit union credit card? You should use it for items that are regularly in your budget–like groceries and rent (unless your landlord charges a fee)–so you know that you can and will be able to make your payments. Don’t pay the minimum payment, because it will accrue interest on the balance, which leads to longer time to pay it off, which could lead to late payments, and a lower credit score. 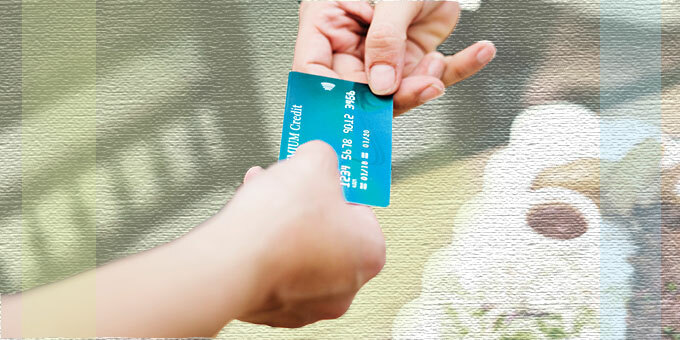 You also don’t want to overuse your card–especially since your card will probably have a low line of credit. A high credit utilization ratio can make you appear risky to the credit reporting agencies. It’s a good, general rule to use less than 30% of your line of credit each month. So, if your credit limit is $2000, you shouldn’t put more than $600 of expenses on your card at a time. What if you can’t get approved for a credit card? If you’re young and your parents are supporting you, they can make you an authorized user on their credit card. This allows you to make charges using their card while keeping you from gathering your own debt. While this will help you build your own line of credit, if your parents have bad credit, it can be harmful to you. If you’ve been an authorized user on a parent’s card for a year or two, you’ll have a much easier time getting approved for a card of your own. Otherwise, consider visiting your favorite Madison credit union. They know you, they know your finances, and they’ll be much more likely to approve your application than a random, major credit card company. They may even get you started with a low-limit card, just as my financial institution did for me, all those years ago. Check out all the credit card options Dane County Credit Union has available for members.